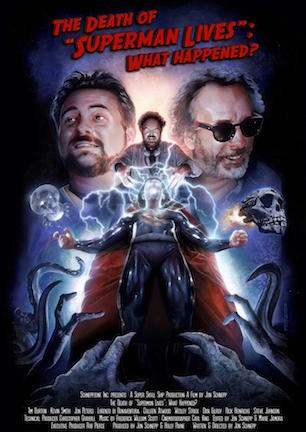 Tim Burton, Kevin Smith, and others discuss the aborted 1998 “Superman Lives” movie that was set to star Nicolas Cage. Smith claims that Peters gave him three guidelines for a new script: no flying, no suit, and Superman must fight a giant spider. Peters denies making the first two demands. Smith renames the spider a Thanagarian Snare Beast. Smith and Peters continue having creative differences until Smith is removed from the project when director Tim Burton is hired. Tim Burton and several artists/designers talk about their initial pre-production work on “Superman Lives.” Wesley Strick is hired to draft a new screenplay that is still based upon the “Death of Superman” storyline from the comic books. Burton and Peters compare the controversial casting of Nicolas Cage as Superman to the initial backlash against casting Michael Keaton as Batman. Courteney Cox, Julianne Moore, and Sandra Bullock are mentioned as the top choices to play Lois Lane. Burton laughs at the notion of Bullock being Jon Peters’ first choice. Chris Rock is mentioned for Jimmy Olsen. Burton expresses that he wanted Christopher Walken to play Brainiac. Through 1997 and 1998, Nicolas Cage undergoes a number of costume tests with Colleen Atwood and her team. Concept artists grow continually frustrated with Jon Peters’ influence on their work. Burton is pressured by the studio to fire Wesley Strick. Dan Gilroy is tasked with drafting another screenplay. After a string of box office failures gives the studio concern for playing their releases safer, Warner Brothers pulls the plug three weeks before production is scheduled to begin due to concerns over the script, lack of confidence in the vision, and the ballooning budget. Warner Brothers instead shifts their focus onto “Wild Wild West” with Will Smith. Entered onto a list including “Jodorowsky’s Dune” (review here) and “Lost Soul: The Doomed Journey of Richard Stanley’s Island of Dr. Moreau” (review here), “The Death of Superman Lives: What Happened?” joins a seemingly booming cadre of behind-the-scenes documentaries exploring nearly mythical legends about movies that were never made. With Tim Burton wearing the director’s beret and Nicolas Cage donning the iconic cape, 1998 was supposed to be the year that Burton did for Krypton’s favorite son what he did for Gotham’s Caped Crusader a decade earlier. Yet when a string of flops gave Warner Brothers feet too cold to go forward and hands hot to pull the plug, leaked scripts and costume test Polaroids became the only insight the public had on this aborted Superman reboot. That is until writer/producer/director Jon Schnepp’s curiosity compelled him to pick up a camera and go straight to the sources for the scoop on what went down and what might have been. Thanks to Kevin Smith, Comic-Con cinephiles are already aware of the ill-fated project’s earliest origins. As Smith admits in “The Death of Superman Lives,” the cult favorite filmmaker built a successful spoken word career out of recalling Tinseltown tales, once highlighted by colorful encounters with producer Jon Peters while developing the first “Superman Lives” screenplay. Those stories have been told and retold, and Schnepp smartly presumes fans in the know have already heard Smith’s version of events at least once. “The Death of Superman Lives” thus sticks mainly to broad strokes regarding Smith and Peters’ creative head-butting simply to keep the uninitiated up to speed. Part of the allure of Smith’s anecdotal recollection has always been his verbal portrait of Jon Peters’ batty behavior, reportedly living up to a stereotypical caricature of a Hollywood peacock eagerly spreading feathers through arrogant antics. On camera, Peters denies demanding that Superman neither fly nor be seen in his signature suit, yet does cop to insisting on the inclusion of polar bears and a giant spider. Some passive-aggressive animosity still flows nearly 20 years later as Peters cannot resist parting pot shots deeming Kevin Smith an “amateur writer” who delivered an unfunny and “unimaginative” script. Various concept artists recall Peters as a loudmouth whose kids called the shots on which long-labored designs deserved a cursory upward thumb and which earned pinched nostrils with an upturned chin. “The Death of Superman Lives” doesn’t go so far as to paint Peters as a full-of-himself villain, though it does want him established as having a quirkily kooky persona. There is a scene where the camera doesn’t cut when Peters takes a phone call mid-interview, leaving Schnepp to chug ceaselessly from his Arrowhead bottle while waiting for a half-minute. It seems like the intention is to make Peters appear rude, although it is so inconsequential of a moment that it doesn’t sway an opinion of the interview subject one way or the other. There is an earnestness to Peters that although a studio fat cat lifestyle may have left him out of touch with humble hairstylist roots, stories like Peters pantomiming director’s actions while Kevin Smith reads his screenplay aloud seem less off-the-wall coming from the horse’s mouth. Hearing Peters explain things from his end, his rationale behind seeming absurdities comes off as not entirely daft. While “The Death of Superman Lives” wants to firmly label Peters as a creative roadblock, there is also some sympathy earned for a “force of nature” producer whose job was to motivate people telling him something could not be done. Peters’ passionate championing of “Superman Lives” is apparent, even if his supposedly nightmarish meddling manufactured migraines behind the scenes. Gossipy anecdotes mostly out of the way, act two of “The Death of Superman Lives” distracts itself from the doc’s primary purpose by devolving into asides addressing “Batman”-related talk and excessive looks inside pre-production workshops. Unless you’re dying to know the nitty gritty behind staples used to connect vinyl tubing to iridescent vacuform, a midsection concentrating on Steve Johnson’s failed costume designs plays like an episode of SyFy’s “Face/Off” instead of addressing the “What Happened?” touted by the movie’s subtitle. Schnepp likely wanted/needed something more visual onscreen than 100 minutes of aging executives and effects artists pondering a past project as talking heads. Tape-recorded footage of costume tests and designers struggling to make things work is virtually all of the live-action footage that exists from the era, so there is some understanding behind why it features so heavily. Still, not only does it stray as mentioned from the “what happened” theme, there are only so many minutes one can watch Colleen Atwood and crew prick safety pins into Nicolas Cage’s cape before the entertainment level takes a temporary nap. On the technical end, “The Death of Superman Lives” shows the rips around its edges. Schnepp records shaky B-roll by walking around Tim Burton’s estate with a camera that fits in his hand. That camera also has a top-mounted microphone, which appears to have been the sole audio source for interviews. Words often bounce off so many walls that it sounds like the movie was recorded in an echo chamber, particularly in Burton’s segments. Schnepp also features on camera in two-shots, primarily to nod “yes” to just about everything that anyone says. Live-action recreations of “Superman Lives” scenes look like parody sketches fit for late-night cable access. Again, “The Death of Superman Lives” is straining to put something onscreen that isn’t a slow zoom on a pencil sketch, but forgetting this roughshod approach to assembling a documentary is harder to do than forgiving it. In this regard, truer words were never spoken. Setting aside kitchen sink inclusions and a fan-made feeling far from Ken Burns-styled craftsmanship, “The Death of Superman Lives: What Happened?” remains a cornucopia of “what if” scenarios certain to tickle a touchstone of nostalgia for 90s superhero cinema. July 20, 2015 by Ian Sedensky.